Paterno is a New York castle. That is the Hudson in the background. This is one of the beauties near NYC that was torn down. You indicated you were looking for information about Paterno Castle-- it was built in the early 1900s by a man named Charles Paterson. It was in upper Manhattan- just north of where the GW Bridge is now. He was a real estate tycoon in the city with his brother. He lived in the castle and then tore it down in the 1930s, built a series of five 13-story buildings on his land (that he called Castle Village) and made it a rental property (opened 1939). 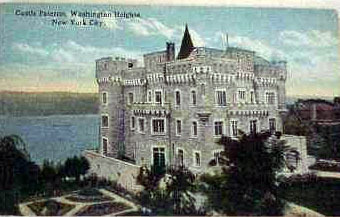 Castle Village still exists and is a co-op building in Washington Heights (Hudson Heights as some call it). Regarding Paterno Castle (1907)...it was built by a relative Charles Paterno - not Paterson, he was originally a doctor. West side of Northern Avenue known as Cabrini Boulevard. It was demolished to construct Castle Village (1937). Saverio Paterno married Celestial Casella. They were from Castelmezzano Italy. Canio Trivigno married Maria Amico. Saverio had a son -Giovanni. Canio had a daughter named Carolina. Giovanni and Carolina married and had 10 kids - Celestina, Saverio, Charles, Joseph, Maria, Michael (whose son Michael married my grandfather's sister Louise in 1936), Anthony, Rose, Theresa and Christina. Domenic Pellettieri married Luigia Trivigno and had a daughter Rose in 1882. I'm related by Trivigno. Rose married Joseph Massari and had 8 kids. (that's how I fit in) One of them was my Grandfather John (1913). When Joseph Massari died my Grandfather John was raised by Anthony Paterno in Paterno Castle. Paterno Brother's Construction (Charles, Joseph, Anthony) involved Morningside Heights and Washington Heights in the Bronx next to Columbia University. They built Casa Italiana at Columbia also in 1926. My grandfather was in the business. Paterno Castle on the Hudson, NYC was built by Dr. Charles V. Paterno, a doctor who never practiced medicine, but went into real estate. He also built a developement in Armonk, NY on Route 22, containing 1270 acres called Windmill Farms in 1910. This is in Westchester County, a few miles from me. I have a copy of a paper written by his son, Carlos M. Paterno, from the North Castle Historical Society telling about this. Dr. Paterno died in 1946. I had never seen a picture of his NYC castle until your website. What a place! So sad it's gone! You have Paterno Castle (in New York State) listed without a location. It is in the Fort Washington section of Manhattan. Priliminary research on this castle done by Phil Bilzor.